There are few things in life better than getting kisses from a dog. However, you may not feel this way if your dog’s breath is so bad it could peel paint! Dogs aren’t self-conscious about their halitosis and will kiss you no matter what ghastly smell is coming from their mouth. Thankfully there are many ways you can be a friend to your best friend, and help them improve their oral health. 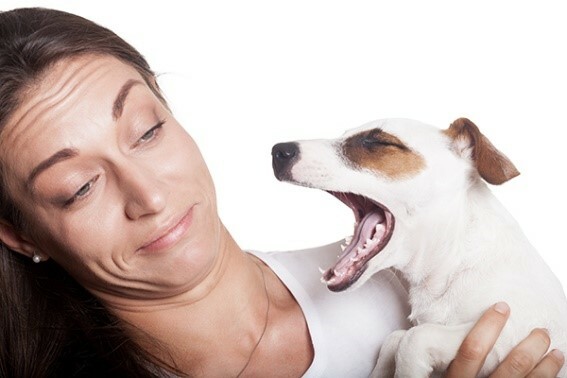 What Causes Canine Bad Breath? Halitosis (or bad breath) in dogs can be caused by several factors. It’s important to speak with your veterinarian about what may be the cause of your dog’s bad breath and rule out any underlying health issues. Periodontal Disease: Like humans, if dogs don’t maintain proper oral hygiene, they can develop dental issues. Tartar and plaque build up are the most common, and can be the culprit behind some nasty morning breath especially if decay is a factor. If this buildup is not treated, it can progress to periodontal disease which includes inflamed gums, overgrowth of bacteria, and even worse breath (if you can imagine it!). Also keep in mind that smaller dogs are more susceptible to periodontal disease than larger dogs because their teeth are packed more closely together making them vulnerable to filthy fangs. Pyoderma: Pyoderma is a bacterial skin infection that is commonly occurs in the facial and lip folds of a dog. Brachycephalic breeds (calling all Pugs, Bulldogs, Pekinese & Boston Terriers!) are especially susceptible to this condition, but it can affect any breed. Symptoms include scaly, crusty, or pustules which produce an odor. They look much like a large, horrible pimple. Treatments include antibacterial sprays , topical hydrocortisone cream, and antibiotics. Kidney Disease: Metabolic issues like kidney disease can also negatively affect your dogs breath. Kidneys help eliminate toxins in the blood stream, so when they are not doing their job, the waste build up can cause a terrible mouth odor. Diabetes: Rather than foul smelling breath, a diabetic dog produces a sickly-sweet fruit like odor in its mouth. This is due to high levels of diabetic ketones that are in the body. It can also smell a little like the acetone you find in nail polish. Brush, Brush, Brush: You (hopefully!) brush your pearly whites twice a day, every day. Now imagine that you’re stuck on a desert island for months without a toothbrush. Things would feel pretty gross inside your mouth, right? This is probably the state of affairs in your dogs’ mouth if you’re not brushing his teeth regularly. Brushing can be a daunting task at first (if you can, start during puppyhood! ), and both you and your dog will have learn together. Start out once a week and gradually increase to at least 3 sessions per week (daily is ideal). There are many flavors of dog tooth paste that are irresistible to dogs, so make sure to find one that your pooch loves. Also make sure to find an appropriately sized toothbrush for your dogs’ mouth. When you go in to brush, get down on your dogs’ level, and let your pup become familiar with both the brush and paste. If your dog is tolerating this, gently pull back their lips and softly brush. Make sure to take breaks to reward your dog with treats (it sounds counterintuitive while brushing but removing tartar/plaque and not necessarily food particles is your number one concern). Be patient, and reassuring to your pooch, and don’t get frustrated if it takes several sessions for him comfortable with the concept. 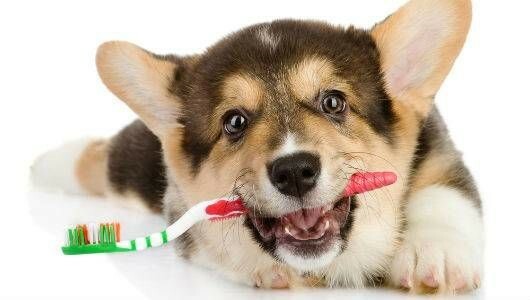 Veterinary Dental Cleanings: If your dog absolutely won’t allow you to brush his teeth and has bad breath, consider a dental cleaning with your vet. Dogs will receive an initial exam and blood work to ensure they are healthy enough for anesthesia. They are then placed under general anesthesia so the dentist can do a thorough cleaning and address any underlying dental problems. For example, a vet may pull a dogs infected tooth during a cleaning if it’s found to be the source of pain, infection, or bad breath. Vets can also treat gum issues they discover during the cleaning. Though many dog owners may be nervous with the idea of anesthetizing their dog, rest assured it’s very safe. Ask your vet about their anesthesia protocol; more and more vets are using local anesthesia during dental procedures to they don’t have to administer as much general anesthesia. Depending on the state of your dog’s oral health, professional cleanings are recommended every 6 months – 1 year. Chews and Treats: There’s no question that your dog is going to love this solution! The right treats may be just what the doctor ordered when it comes to treating their bad breath. Dental chews are designed to help remove tartar and plaque while satisfying your dogs natural urge to chew. Make sure to never leave your dog unattended with a chew, and check labels to avoid artificial ingredients, sugar, and fillers. For a special treat, consider giving your dog a raw frozen bone! They will go crazy for it, and these bones encourage a pH level that kills bacteria in their mouth!